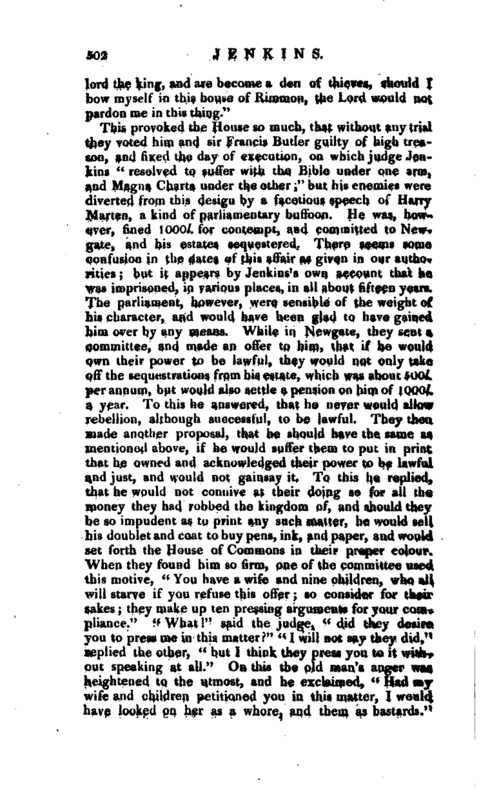 This provoked the House so much, that without any trial they voted him and sir Francis Butler guilty of high treason, and fixed the day of execution, on which judge Jenkins “resolved to suffer with the Bible under one arm, and Magna Charta under the other;” but his enemies were diverted from this design by a facetious speech of Harry Marten, a kind of parliamentary buffoon. He was, however, fined 1000l. for contempt, and committed to Newgate, and his estates sequestered. 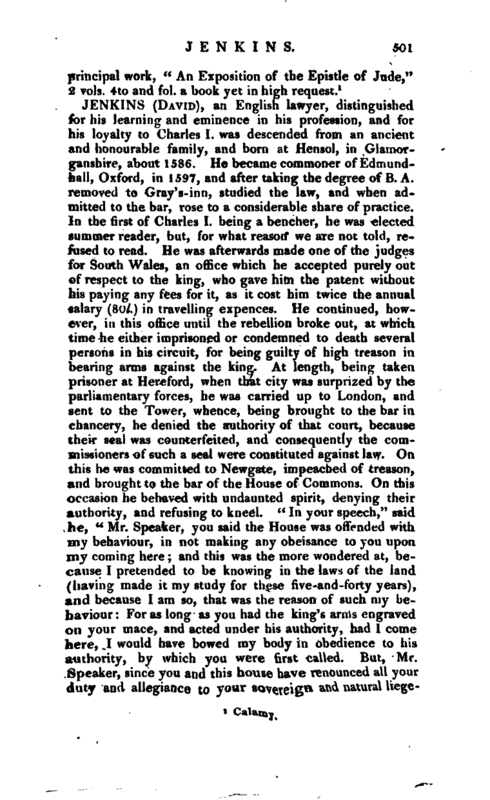 There seems some confusion in the dates of this affair as given in our autho^ rities; but it appears by Jenkins’s own account that he was imprisoned, in various places, in all about fifteen years. The parliament, however, were sensible of the weight of his character, and would have been glad to have gained him over by’any means. While in Newgate, they sent a committee, and made an offer to him, that if he“would own their power to be lawful, they would not only take off the sequestrations from his estate, which was about 500l. per annum, but would also settle a pension on him of 1000l. a year. To this he answered, that he never would allow rebellion, although successful, to be lawful. They then made another proposal, that he should have the same as mentioned above, if he would suffer them to put in print that he owned and acknowledged their power to be lawful and just, and would not gainsay it. To this he replied, that he would not connive at their doing so for all the money they had robbed the kingdom of, and should they be so impudent as to print any such matter, he would sell his doublet and coat to buy pens, ink, and paper, and would set forth the House of Commons in their proper colour. When they found him so firm, one of the committee used this motive,” You have a wife and nine children, who all will starve if you refuse this offer; so consider for their sakes; they make up ten pressing arguments for your compliance.“” What 1“said the judge,” did they desire you to press me in this matter?“” I will not say they did,“replied the other,” but I think they press you to it without speaking at all.“On this the old man’s anger was heightened to the utmost, and he exclaimed,” Had my wife and children petitioned you in this matter, I would have looked on her as a whore, and them as bastards." 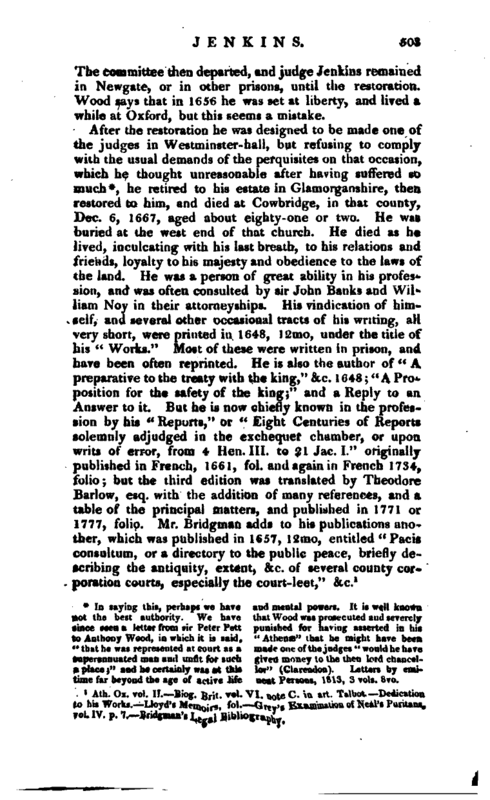 | The committee then departed, and judge Jenkins remained in Newgate, or in other prisons, until the restoration. 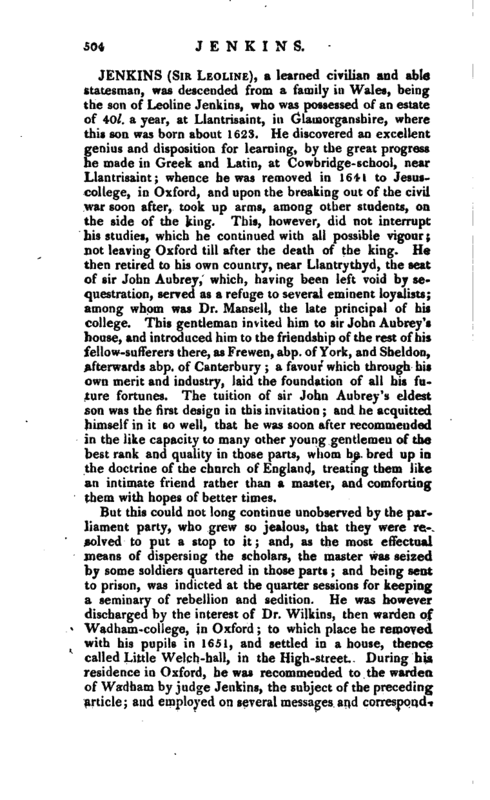 Wood says that in 1656 he was set at liberty, and lived a while at Oxford, but this seems a mistake. In saying this, perhaps we have not the best authority. We have since seen a letter from sir Peter Pett to Anthony Wood, in which it is said, “that he was represented at court as a superannuated man and unfit for such a place;” and he certainly was at this time far beyond the age of active life and mental powers. It is well known that Wood was prosecuted and severely punished for having asserted in his “Athense” that he might have been made one of the judges “would he have given money to the then lord chancellor” (Clarendon). Letters by ciuineut Persons, 1813, 3 vols. 8vo. Ath. Ox. vol. II.—Biog. Brit. vol. VI. note C. in art. Talbot—Dedication to his Works.—Lloyd’s Memoirs, fol.—Grey’s Examination of Neal’s Puritans, vol. IV. p. 7.—Bridgman’s Legal Bibliography.